From here on, we begin the last leg of our journey in this mythical, mystical and beautiful country of Bhutan. And, like the icing on the cake, the last few days of the trip built up to a befitting crescendo. As we bade goodbye to Punakha, we rounded it up with an exhilarating white river rafting ride on the Mo Chhu river. 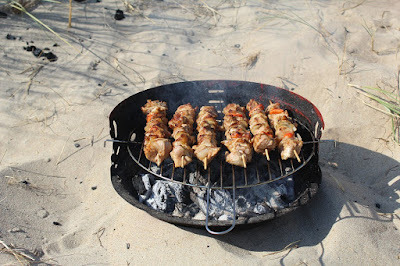 This was not on our itinerary initially but one we could, fortunately, fit into our schedules and oh boy, did we enjoy it! Our group could be best called as rookies in the field of adventure sports and were suitably excited and anxious about what to expect. We assembled at the starting point of the one-hour rafting ride on the Mo Chhu waters, slated to end at the Punakha Dzong where the Mo Chhu and Po Chhu merged as one. Our rafting guide, Karma, was a cheerful and lively fellow who kept us (and the kids) entertained through the entire ride with his perky commentary and instructions. At the outset, we were given our life jackets, head gear, and the oars with specific instructions on how to hold the oars and the precise rowing movement to follow upon the said command from him. We were to basically aid him, the lead navigator, to traverse along the rapids. 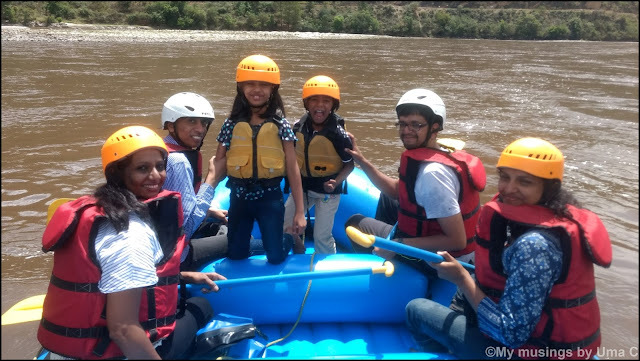 This was going to be a basic level rafting with zero-risk and we made sure that our frisky kids were eligible for the ride. All set for the ride: happy and excited! We had never imagined the kind of fun that ensued. Every rapid we encountered had us in raptures and soaked to the skin, the sudden uptilt of the raft as it glided over the waves brought out peals of nervous laughter. Our guide kept the atmosphere light and lively with his pep talk, encouragement and anecdotes. Our driver, Tending met us at the point where our river rafting ride ended and we left Punakha for Paro, our minds and body still tingling with the thrilling experience. We once again stopped by at Dochula pass, but this time it was for lunch. Paro was about a 3-hour drive thence. Can you guess this location from the image below? It's the airport at Paro. Wedged between mountains and a river, isn't it such a beauty? Now, imagine being able to catch this view from thousands of feet above on a flight and watch this spectacular sight zoom in slowly as you gently glide down and touch the runway. While we weren't lucky enough to experience a flight journey thus, we were certainly lucky to catch an airplane take off and then again a couple of days later, on our return journey, another making its descent. 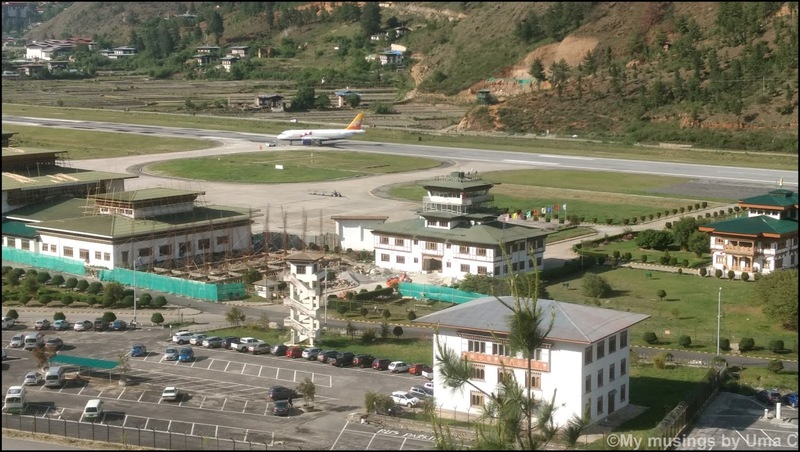 Considering the rather low frequency of flights in and out of Bhutan, these were rare sights, indeed. On a side note, how convenient it must be to simply walk into the terminal from one end and then hop onto the aircraft from the other end just like that! As the sun began to sink behind the mighty Himalayan peaks, we reached the resort at our final destination, Paro. 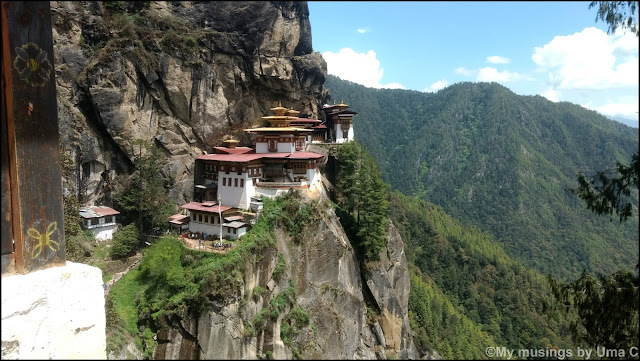 We were advised to rest well for a long and tedious trek next day to the Tiger's Nest Monastery or the Taktsang monastery. 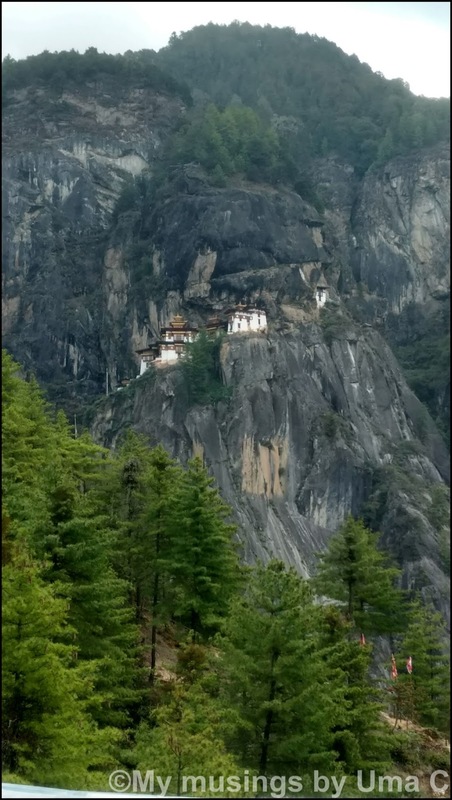 This monastery is rather significant in the mythology of Bhutan as it is believed that Guru Rinpoche flew, seated on a Tigress, atop the cliff of this mountain to quell certain evil forces and it was then he discovered a tiger's cave or nest. The tigress on whose back he flew was none another than one of his consorts who transformed herself into one to aid the Guru in vanquishing the demonic forces. We booked a guide from our hotel for this trip since the monument was a treasure trove of stories and mythological beliefs of the Buddhists and we were eager to hear them all. Can you see how high up there we had to climb and how steep that is? That's a total of 10 km (the ascent and descent put together). And, none of us had even done a 10 km marathon on a level ground before! That we were skeptical and apprehensive was putting it down mildly. The only thing we knew was that we didn't want to give this a miss at any cost. We learned that there are ponies available for the ascent up to a certain point (for a distance of 2km until the cafeteria) post which one had to eventually go by foot. We decided to use the option. And, it proved to be a very wise decision. 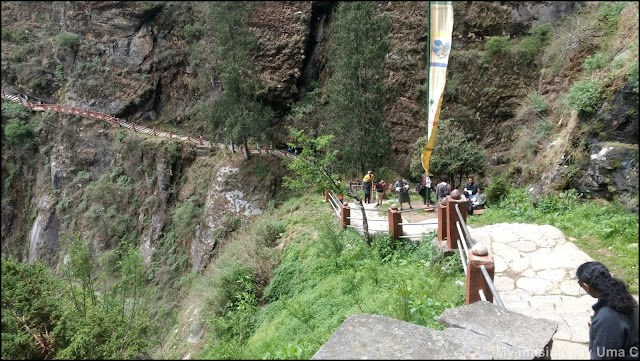 The journey is certainly long and tedious, so if you are a rookie trekker, don't be embarrassed or shy to do the same (even if you see people older than you climb all the way). Remember, you have to also walk all the way down. But, what did I know? It's not a cake walk to ride a pony on the steep slopes. One, you feel bad for the poor creatures. Two (and, here I only speak for myself), the horses are definitely sure-footed but as they totter on the rocky edges from where you can see the deep valley right below your feet, you can only hold on to dear life and wonder if it would have been a wiser decision to trudge on foot. Yet, now that I came back alive I can say that pony backs will save you the precious energy you need to conserve for the rest of the trek. So near, yet so far. After this point, there were treacherous stony steps that wound down and then upwards in a zig-zag manner right up to the end point. Just a tiny glimpse of the path we traversed. At a landing that provided a bird's eye view, perfect for taking proud selfies. It was surely a proud moment as we made it to the monastery. There are about 5-6 temples clustered together within the main monastery. Each of these depicts the Guru in various emotions, each of them carrying a significance and a little story. The tiredness of the trek dissipates slowly even as peace and awe envelopes you in a spiritual embrace. Did we collapse in exhaustion after the trek? What you need to know before you embark on this trek? All this in my next post. Do come back! Whew! Commendable feat Uma! I am feeling my muscles strain in protest even while reading this! You did yourself proud! The river rafting is one of the most fun activities, I know! The airport shot is simply wow! Loved your narration of your pony ride through the treacherous route. And the photos are treasures! Thanks a lot, Kala for your kind words. I surprised myself by being able to do this trek. I'm glad I could! Wow! Good stuff, Uma. I have never tried river rafting. Too chicken for that. But, after your thumbs up, I guess I will want to give it a try sometime. That route to the monastery was crazy. I hate these narrow mountain routes and you are right, I prefer doing it on foot than ponies. That airport is so cozy and nice, especially when one thinks of our Bangalore airport. Lovely travelogue, Uma. Hey you must try the river rafting. It was too much fun! Ya, the pony was scarier than I had imagine but it saved us precious time and energy. Thanks a lot, Rachna! Oh I hate going on ponies on rocky climbs. It's exactly like you said - I feel more confident on my own two feet. And that is one reason I'm skeptical about ever going to Bhutan. The heights scare me so, that I cannot enjoy the view or anything else. The river rafting sounded safe though - maybe it was the picture of those little one on that raft that reassured me :-). The names of those two rivers are so quaint - MoChhu PoChhu. You didn't tell us the meaning :-). I was surprised too that they allowed kids. My sister and I kept asking them to re-confirm. We even elaborated on how frisky and restless they are but in the end it was all fine :) The water was not very choppy. Wow! What an adventurous trip. Rocky climbs on ponies and river rafting are two things that made my heart go skip a beat and then be taken over by fear to beat at an alarming pace. That monastery is at an amazing location and your fantastic pictures have captured the views in full glory. You made me add Bhutan to my travel bucket list. But my favorite are the names of those rivers. The pictures are beautiful! 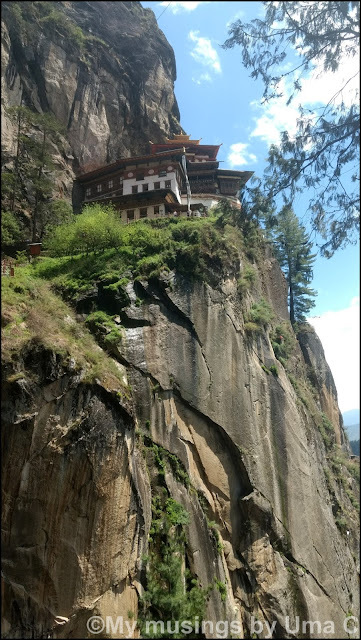 Will read all of your Bhutan experiences. Seems like a wonderful place.